Logins this hour: 19255 ? A staffing link lets you populate a shift in your schedule with assignments from another schedule. You can create links between groups within an Enterprise display or schedules in other accounts. 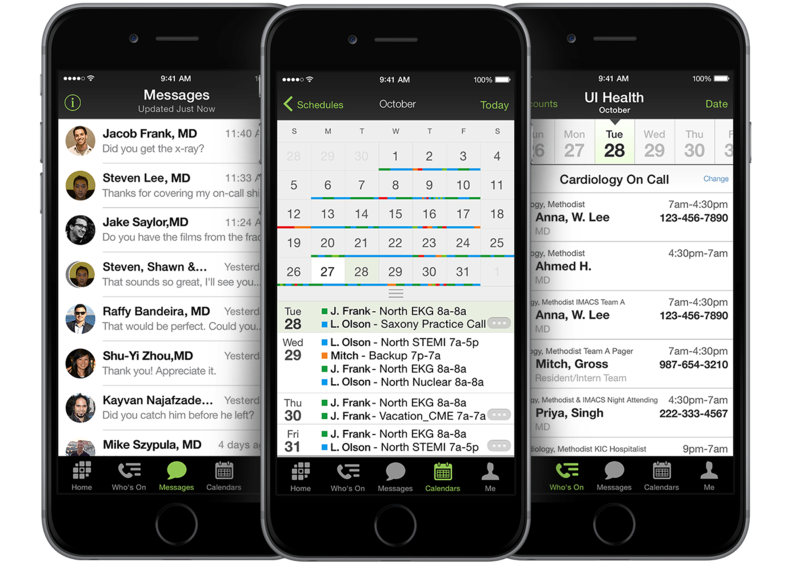 In an Enterprise, for example, you may want to generate a call list taken from departments that provide coverage to the ER by pulling data from relevant lines in a number of specialty schedules. By using staffing links, you avoid having to transcribe assignments. Each department keeps its schedules up-to-date and their coverage feeds to other views through staffing links. 1. In OnCall, select File > General Setup > Services Tab. Enter in the names of the shifts or assignments you want to include so they mirror the schedule you'll be pulling from. Close out of General Setup when finished. 2. Right-click on the shift name where you would like to link data from another schedule. 3. Select Amion Staffing Link from the pop-up menu. 4. In the upper drop-down box, select a group from your enterprise site. Or type the staff password for a group that isn't associated with your schedule or hospital. 5. In the lower drop-down, select the shift from which you want to draw shift assignments. 6. By default, hours and all days mirror the linked shift. The options at the bottom of the stalling-link toolbox let you use hours you set or link only days that are unstaffed in your schedule. You may also select the option to link in a group's full schedule when a linked in staff person is selected from the "Who's on" list. 6. Red and blue circles, will appear inside your schedule. Mouse over the circles to read details of the staffing link. 7. Publish your schedule to Amion and assignments from the linked in shift will appear in the online view. 1. Right-click on the shift name and select Amion staffing link. 2. 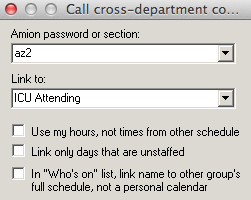 In the Staffing Link window, delete the group name or password from the upper drop-down selector box. The small circles in the row will disappear. 3. Publish your schedule for the change to take effect. Here we discuss staffing link.